Martin Upton, Director, True Potential PUFin, The Open University Business School. 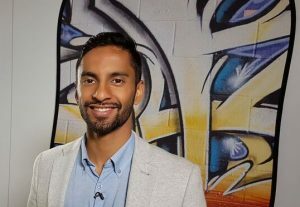 The Open University Business School’s True Potential Centre for the Public Understanding of Finance (True Potential PUFin) has joined forces with University Challenge star and Arithmophobia Expert, Bobby Seagull, and MoneySavingExpert’s Martin Lewis, to develop a free badged open course on OpenLearn, specifically designed for the financial education needs of 16 to 18 year olds. Managing My Money for Young Adults, (MMM-Y), which launched on 3 November, is delivered through video content, animations, case studies, activities and quizzes and provides 24 hours of learning broken into eight bite-sized sessions (see below for further details), to offer learners a strong foundation of personal finance knowledge to help them avoid bad debt in the future. University Challenge star and Arithmophobia Expert, Bobby Seagull. The motivation for launching the course comes from extensive evidence of the need to provide effective personal finance education for those approaching adulthood. Research by StepChange has highlighted the fast growth of debt problems amongst the under-25s, with recent research conducted by True Potential PUFin, revealing one in seven 18 year olds are already in debt. Almost two-thirds (60%) of those in debt admit they owe money to payday loan companies – £168 each on average. Excluding more traditional student borrowing, these 18 year olds have already racked up debts on credit cards (60%) totalling £14.5 million, unauthorised overdrafts (57%), store cards (49%) and catalogues (49%). Nearly two-thirds (64%) of this age group believe this could have been avoided if they’d received more effective personal finance education, with 94% saying it would have been prevented with some form of guidance or support. This follows a recent report from the Financial Conduct Authority (FCA), which warns of a ‘pronounced’ build up of debt amongst young people as they are forced to borrow money for basic living costs. The course has been designed so that learners can choose to work on the course at home, perhaps with their families, or in group sessions at school or college, facilitated by teaching staff. Learning is driven by videos and video animations, case studies, activities and quizzes. A budgeting web app (available on Managing My Budget) and a forum facilitated by experts bring to life the key skills and perspectives of money management. Feedback is provided for all the activities and quizzes in the course, enabling learners to check their progress and understanding. There are two types of quiz: short practice quizzes and two longer badge quizzes at the end of Sessions 4 and 8. Completion of all the sessions and a score of 50% or more in the two badge quizzes make learners eligible for a Statement of Participation and digital badge, details of which are in the Introduction and guidance. But it’s not just help when it comes to managing debts that young adults require. Guidance is also needed to understand how to budget effectively, how to choose between an array of financial products, how to use credit cards properly, how to understand taxation and how to manage finances when leaving home to go into higher education or to take up a job, and much more besides in this changing and challenging financial environment. Managing My Money for Young Adults, The Open University. Teaching staff also need help too when it comes to providing personal finance education in the classroom – a responsibility all schools in the UK now have. This course provides the resources to help deliver this in the classroom in an interesting and informative way. A 23-page teacher’s pack has been designed to provide a step by step guide around both delivery and content of the course. 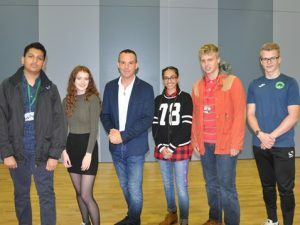 Martin Lewis with students from Denbigh School in Milton Keynes. Martin Lewis of moneysavingexpert.com is also involved in the course. In a series of videos he talks to students at Denbigh School, Milton Keynes about personal finance issues including student finance, credit cards and being an astute consumer. The students at Denbigh School also have their say in a set of three videos where they discuss their own money management and the areas of personal finance of particular interest to them. This is the fourth in a series of financial education courses we’ve launched over the past three years and we feel it’s got the potential to be the biggest game changer yet. While debt has its place in society and it’s not always negative. We are on a mission to ensure informed financial decisions are made before the dominos of debt start to tumble. Our aim is to sign up 23,000 16 to 18 year olds on to the course by Christmas 2017, as we try to break the cycle of debt for as many young people as possible. The course has been launched as part of the Business School’s ongoing initiative, which has received funding of over £2 million from a range of donors including True Potential LLP, and the Chartered Accountants’ Livery Company Charity, which has funded the development of this course. Managing My Money for Young adults has been produced by the True Potential Centre for the Public Understanding of Finance (True Potential PUFin), based at The Open University Business School, thanks to funding provided by the Chartered Accountants’ Livery Company Charity. True Potential PUFin was established in 2013 as a result of funding generously provided by True Potential LLP. This entry was posted in Education, Resources, School-University Engagement and tagged budgeting, business, Denbigh school, Digital engagement, Engaging opportunities, engaging with school students, finance, MOOC, OER, open access, SUPI on Monday, 6 November 2017 by Martin Upton.